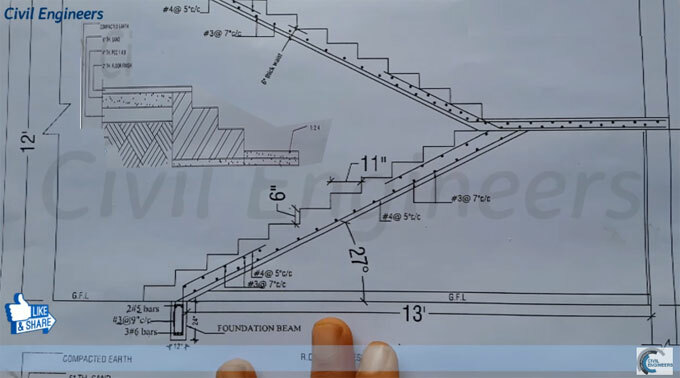 The construction video sifts through the detail process for reading out the structural drawing of a RCC Dog Leg Staircase. The height of the stair from ground finish level to finish floor level is taken as 12 feet. There are two flights for the stair. The height of the first flight is 7 feet and running length is taken as 13 feet. RCC Dog-legged Staircase, the successive flights increase in opposite directions. The two flights in plan remain attached with a well. A landing is arranged similar to the level at which the direction of the flight modifies. The stairs are categorized as the following on the basis of the direction along which a stair slab extends. Watch the following video to get more details.